Self-Portrait, © National Portrait Gallery [click to enlarge, and for more information]. Born in London on 25 September 1820, Frederick Richard Pickersgill is generally seen as a genre or history painter, as well as an illustrator. His father, Richard Pickersgill, was a naval officer but also a keen amateur painter of marine and landscape subjects. His mother, Anne Witherington, was the sister of the artist William Frederick Witherington (1785–1865), while his paternal uncle was the eminent portrait painter Henry William Pickersgill (1782–1875). 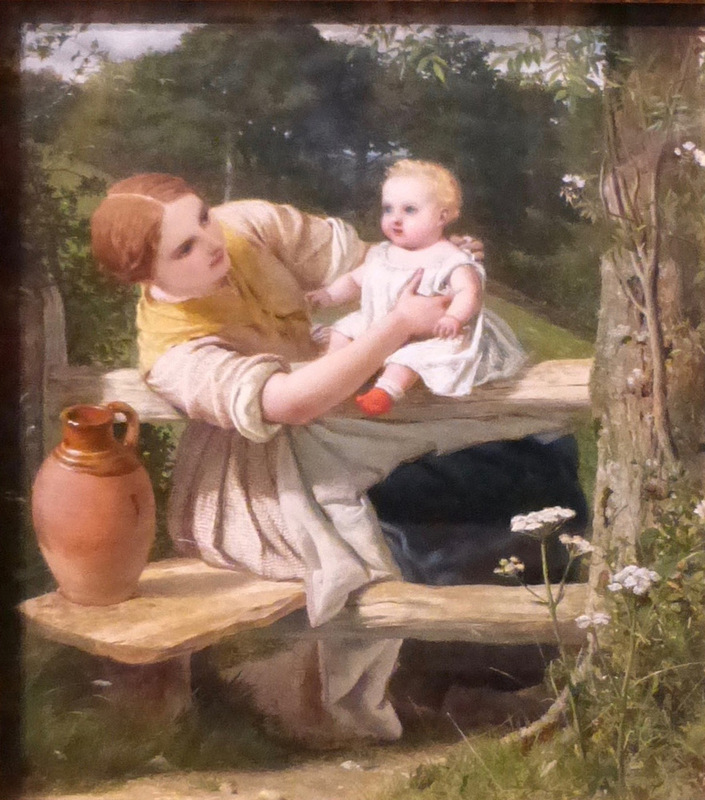 Not surprisingly in such a family, both Frederick and his cousin Henry Hall Pickersgill (1812–1861) also became artists. 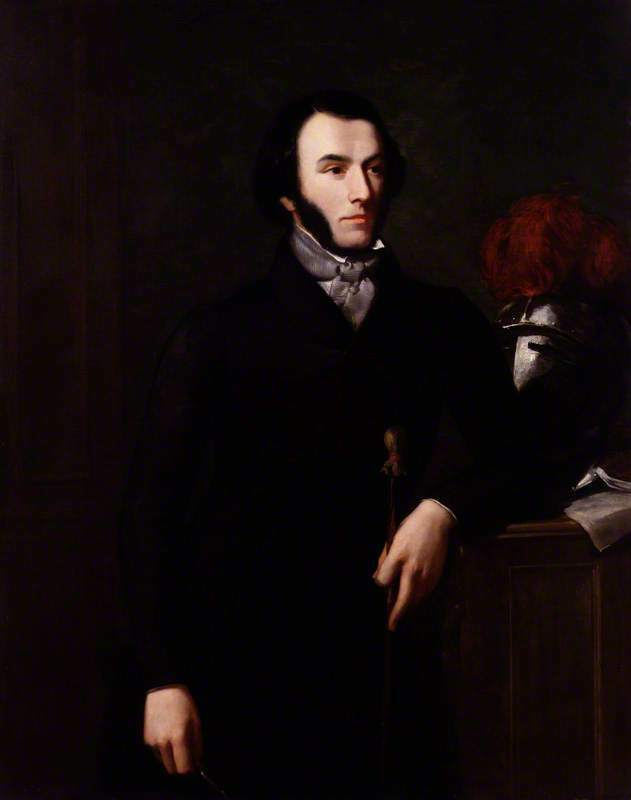 Frederick studied first under his maternal uncle, and then at the Royal Academy Schools, having already exhibited at the Royal Academy in 1839. Extending the family's artistic connections still further, in 1847 he married Mary, sister of James Clarke Hook, an artist best known now for his marine subjects. Pickershill's own subjects were generally historical, mythological, Biblical or literary. In literature, he often found his inspiration in Spenser or Shakespeare: in 1843 his preparatory cartoon of The Death of King Lear won a prize in the competition for decorating the Houses of Parliament. He was not the final winner on that occasion, but he later won a more substantial prize for his painting of the Funeral of Harold at Waltham Abbey (1847), which Parliament duly acquired. On the Way to the Spring [click to enlarge, and for more information]. Benezit Dictionary of Briyish Graphic Artists and Illustrators. Vol. I. Oxford: Oxford University Press, 2012. Ruskin, John. "Academy Notes." Works of John Ruskin Vol 14. Ed. E.T. Cook and Alexander Wedderbirn. London: George Allen, 1904. Internet Archive. Contributed by the Getty Research Institute. Web. 14 March 2019. Valentine, Helen. "Pickersgill, Frederick Richard (1820–1900), history painter." book">Oxford Dictionary of National Biography. Online ed. Web. 14 March 2019.